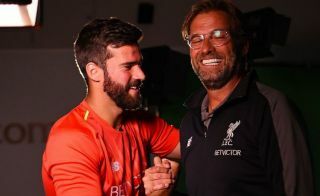 Liverpool manager Jurgen Klopp has hinted at possible bad news around the corner for Chelsea after completing the transfer of Alisson this evening. The Reds have tonight announced the signing of the Brazilian goalkeeper from Roma in what is widely reported as being a world-record move for a player in his position. Roma chief Monchi confirmed earlier today that Alisson would be making a world-record transfer to Anfield, though he did not name the specific price, though the Times and most other sources have it at around £66million. While this could undoubtedly be pressurising for the 25-year-old, Klopp dismissed it as an issue as neither he nor the player decided how much he would cost. Interestingly, however, the German tactician followed that up by suggesting he expected more big-money goalkeeper transfers in the next few weeks as their value has gone up at the moment. ‘He has nothing to do with the price, we have nothing to do with the price, it’s the market, that’s how it is and we will not think a lot about it,’ Klopp told Liverpool’s official site. Worryingly for Chelsea fans, Klopp sounds as if he might know something about Thibaut Courtois leaving the club, as Goal have claimed he’s set to do despite his departure to Real Madrid being temporarily put on hold. Goal’s report says Chelsea will likely also play their part in this goalkeeping merry-go-round, as they’ll only sell Courtois once they have a replacement. Sky Sports have linked them with Petr Cech and Kasper Schmeichel as potential options, so all this speculation suggests Klopp is right. Did Jurgen Klopp hint at Thibaut Courtois leaving Chelsea?